There’s a universe of amazing daily deals out there, but it's hard to find them all in one place—and even harder to discover the ones that really matter to you. We’re making improvements to Google Offers that help address this challenge. First, we’re delivering more amazing deals from a bunch of new categories including outdoor adventure sports, luxury experiences, family-friendly events, classes and more. We’re also introducing a personalization quiz to help you find just the deal you want, all in one place. Google Offers subscribers in the San Francisco Bay Area will have access to these new deals, and the quiz is now available in all cities. We'll gradually roll out an expanded offers inventory to new cities in the months to come. To make all this happen, we’ve partnered with the best deal providers in the industry including Dealfind, DoodleDeals, Gilt City, GolfNow, HomeRun, Juice in the City, kgbdeals, Mamapedia, Plum District, PopSugar Shop, ReachDeals, Active.com Schwaggle, TIPPR and zozi. Now, with one account you can easily purchase, manage and redeem all your offers in one place. Our new personalization quiz is a first step towards bringing you more relevant deals. You can tell us what categories you’re interested in and where you hang out so we can send you just the tailored offers that match your interests—all in one email. If you’re not the outdoorsy type or interested in cosmetic treatments, then we won’t send you deals for zipline adventures and laser hair removal. Don’t worry, if your interests change you can always update your preferences. 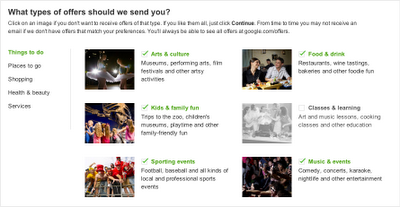 You can subscribe to receive deals that match your interests and learn more about Google Offers at google.com/offers. If you’re a deal provider interested in partnering with Google Offers, please submit your application using this form. Finally, thanks to The Dealmap team that recently joined Google. They definitely helped on this one and we’re looking forward to working with them to develop many new ideas in the months and years to come.